One of the things I love about Thailand is the amount of live music and shows that I get to see. Sometimes it's a band playing at a restaurant, or perhaps it's karaoke at a village festival, or maybe it's a children's troop performing a dance routine. Not all of it is great talent, but it is always performed with zest and fun and huge smiles, so it's easy to forgive the off-key notes and asynchronous dance steps. I was in Pattaya last night and as we strolled down the infamous Walking Street (think Bourbon Street on steroids) I was amazed at how many bands were performing in the bars. And they were all quite good, whether they were playing Thai love songs or Bob Marley or the Rolling Stones or hip hop cover songs. Even the Thai Elvis wasn't bad. But live performances are even better when I know the people who are performing. I have always loved watching my friends in band concerts or in stage plays or dance recitals. When I know the person on stage and I know their normal everyday personality, and then I see them become someone else for a few minutes, it sends chills down my spine. Especially when they forget the crowd in front of them and it's just them and their bass or their dance or their script. They tilt their head back a bit and close their eyes and pour their soul into their art. It brings me close to tears every time. This week I was lucky enough to experience this not once but twice. The reason for being in Pattaya last night was to watch my friend Jay give a singing concert at a fundraiser. (Jay is the "male voice" for the ITS4Thai website, by the way.) We thought it would be a small affair at a piano bar, but in fact it was in the street in front of the bar and hundreds of Thais and farang were in attendance. Jay's performance was great, and the songs he picked (none of which I knew) really highlighted his talent. And then this evening I went to hear an ex-student of mine named Yossiri play bass in his band at Central World. He said that it was a hard-rock band, but the music they played was surprisingly melodic and downright bouncy at times. Again, I loved being in the crowd and watching someone I know pour his passion out for an appreciative audience. Yossiri sent me a link to his band's You Tube video from this show. It's not very high quality, but you can still make him out playing bass on the right side of the stage. Feel free to check it out! About a week ago I was walking along Thong Lo Soi 10, and noticed that the club Muse still had Christmas decorations out in front of the building. The decorations consisted of a big glass pyramid with flashing white lights that represented a Christmas tree, four smaller brightly lit trees, and several very bright white reindeer prancing around. It was very eye-catching, very modern, and very Western. Yup, a 15-foot flashing red heart with a swarm of mandolin-playing cherubs flying around. And again, the only thing Thai about this place is the clientele! It has been a long time since I rode my bike. So long in fact, that when I got it out this morning to join Chris on a long ride out in the countryside, there was a thick layer of dust over the bike and lock and helmet. But I was excited to get out of the city and explore the rice fields again. Around 5 AM I woke up without an alarm and jumped out of bed. By 6 I was eating a quick breakfast at Mc Donalds at J-Avenue and waiting for Chris to come by and pick me up. He finally showed up with his friend Peter who lives in Shanghai, and the three of us headed off towards the airport with our three bikes on a car rack. 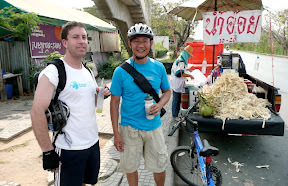 We started our bike tour at a wat just north of the airport, and made a lesurely 32 km route through the rice fields as the sun was rising. The air was fairly cool, and the roads were mostly empty, so it was a very enjoyable ride. Neither Peter nor I had done much riding recently, so we begged Chris to take it slow and easy, which he did. By the time we got back to our parked car at the wat, I was tired but not completely exhausted. We loaded up the bikes again on the rack on the back of the car, and headed home. But unfortunately, we only made it a few miles when the rack broke! We were stuck 30 kilometers from home with no way to get all of the bikes back, other than to ride them. So that's what we did. About 10 kilometers into the trip my legs were starting to cramp up a bit and so we found a nice little restaurant that had a seating area on the roof where we could relax. We ended up ordering several plates of delicious Thai food and a few Thai beers, and I definitely felt better after that. We eventually made it home, after a few more breaks, including one stop at a truck parked on the side of the road selling fresh-squeezed sugar cane juice. In this picture that Chris took, you can see a very unflattering photo of a very tired me enjoying my sugar cane! But all in all, it was a great adventure and I loved every bit of it (except for the aching legs). Here is a Google Map of the two routes we took. If you'd like to see some pictures from the ride, then click on the "View Larger Map" link and then click on the pins. A little box will pop up with a picture that was taken at that very location! You can also view some more pictures taken by Chris and myself during our adventure. This is a follow-up to the Work Permits for Beggars post that I wrote yesterday. I was compelled to write it after reading someone else's take on the situation. I have been thinking more about the proposed law to deal with homeless beggars on the streets of Bangkok. It seems to me that the point is not to make sure that all homeless people have ID cards and work permits. Hopefully the government knows that this is impossible. Some of these people can barely keep up with their clothes, let alone ID documents. I think the main point of the law is to crack down on the exploitation of others. As I said yesterday, I have heard that some beggars are put on the streets and forced to beg by others who simply take the majority of the money collected. This is especially evident around Siam and MBK, where I see the same beggars year after year, except that every year or so they get a new baby to hold or a new puppy dog all in the hopes of eliciting sympathy from Thai shoppers or farang tourists. I don't know the details about Thai law on this subject, but perhaps they are closing a loophole or getting this kind of language in the code of law so that they can go after those who exploit others for their own gain in this way. I think that these people are who the law is directed at, not at the elderly or the physically or mentally disabled that I see on the streets every day. At least I hope that is the case. Like most big cities in the world, Bangkok has its share of people begging on the streets. It seems to be focused in the Silom/Sukumvit business district, and although it is not as big a problem as other cities (San Francisco, I'm looking at you), it seems to me like I have been seeing more and more begging this year than before. I have heard rumors that many of the beggars are actually Cambodian or Burmese. Other rumors say that the people are placed on the street by individuals who use them to make money for themselves. I don't have any proof to back up these rumors, but they seem entirely possible to me. Being a beggar will not be so easy anymore if draft legislation approved by the cabinet yesterday becomes law. The bill proposed by the Human Security and Social Development Ministry sets conditions for people who want to be beggars. They must provide proof they are underprivileged, disabled, homeless or elderly without children to care for them. And this will be a reserved occupation, exclusively for Thais who must carry ID cards. Would-be professional beggars will have to report to local administration organisations for approval and work permits. Local agencies will be responsible for controlling beggars in their jurisdictions, while the Social Development and Welfare Department will have special centres to help them and programmes to care for them. Those who force other people to beg, or exploit them, will be liable to criminal punishment, deputy government spokeswoman Suparat Nakboonnam said. Passing the legislation into law would help the authorities get rid of the large number of foreign beggars in the country, she said. The bill will soon be handed to the government whips and then go to parliament for approval. If passed, it will replace the 1941 Begging Control Act, which is outdated and begging for a makeover, Ms Suparat said. So if this bill passes, does that mean there's going to be a round-up of beggars who do not meet the requirements of the job? Or will this just be another ignored, unenforced Thai law? Last Friday, I was interviewed by a reporter from the Daily Express, a new newspaper in Bangkok that published by the Nation Group. The interview was about our Learn Thai Language website, ITS4Thai, and as far as I could tell, it went pretty well. Although I have to admit that he completely stumped me with one fairly simple question. After rambling on and on for about five minutes, I finally came up with a good answer. I'll be ready the next time I am asked, though! The resulting article is running in today's paper, but I thought I'd reprint the full text here. An American computer engineer has developed an interactive Thai-language tutor for tourists heading here. It was 38-year-old Stuart Towns' own efforts at learning the language that led to the Web-based learning idea. It's simple to use and all it takes is your own time. "I was inspired by learning Thai myself," Towns says. "It can be difficult for most foreigners. My friends and I found it hard, even though we were living here," he adds. Back in 2003, Towns was finding it hard to communicate with the locals - he couldn't order food, buy a bus ticket or find his way back home. He got lost in translation, a lot. So, Towns bought a book and then started taking lessons. None of this worked. "Many others have trouble with books and lessons, too. The biggest problem is tones. It takes us a long time to hear and pronounce the tones." Using his extensive background in computer engineering with some of the biggest dotcoms around, he set to work with friends to set up its4thai.com. The site provides multimedia learning, presenting interactive vocabulary and grammar exercises and audio clips spoken by native speakers. Games help with practice in different settings. The site keeps track of a student's progress and tailors exercises to reflect needs. "In the long term computers will become teachers, and that's why we are going there. We want the computer to be able to look at what the student knows, and help them fill in the blanks. No site or program I have ever seen does this well," Towns says. >> its4thai courses cost between Bt199 and Bt499. >> The cheapest option gives students access to 30 words a lesson. >> The Bt499 option provides unlimited access in 60 lessons. >> New users get 10 free lessons. The original article can be accessed on the Daily Express website. This page is an archive of recent entries in the Bangkok category. Angkor Wat is the previous category. Europe is the next category.